Though they are now relatively youthful compared with the general population, Latinos will account for a growing proportion of middle-aged and elderly Americans in the future. By 2050, for example, the Hispanic share of the elderly population will almost triple to 17 percent from 6 percent in 2005. Furthermore, growth in the Hispanic population increasingly will be driven by births in the United States, rather than immigration from abroad.9 Since U.S.-born Hispanics tend to be less healthy than Hispanic immigrants, this compositional change may further predispose the population to chronic illness. 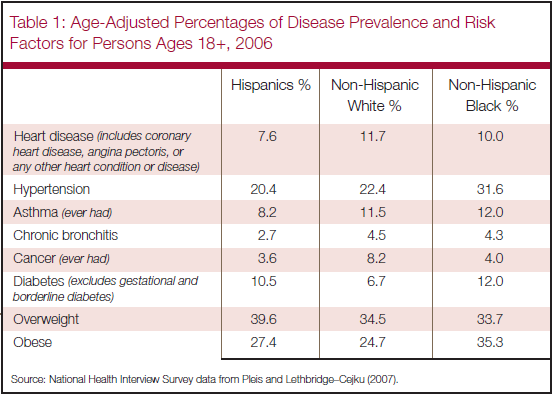 According to the CDC,12 the proportion of Hispanics who report that they have no usual place to receive health care is more than double that of non-Hispanic whites and non-Hispanic blacks. * Though it is more difficult to measure general knowledge and education about health issues among the population, the sheer diversity of the Hispanic population creates a challenge to information dissemination within medical environments as well as through public health campaigns. In addition to divisions by gender, income and education, a number of other key characteristics distinguish Hispanics from each other. The language divide between Hispanics who are English speakers and those who are primarily Spanish speakers creates obstacles to public health campaigns and medical care. 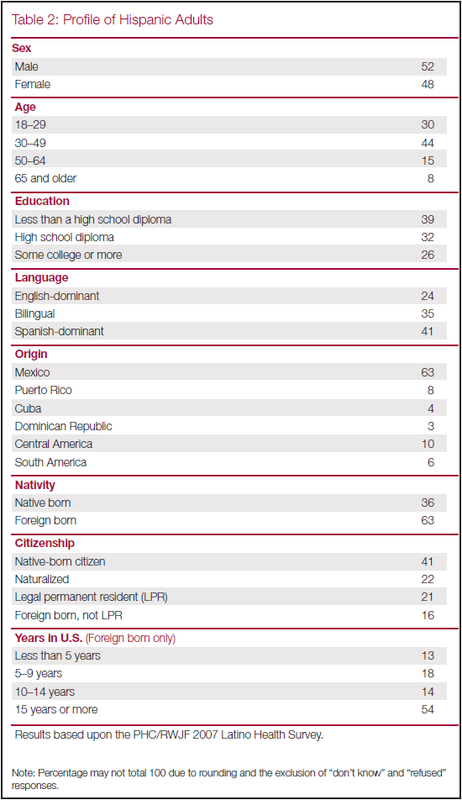 Differences between U.S.-born Hispanics and Hispanic immigrants, between Hispanic immigrants from different countries of origin, as well as differing rates of assimilation by Latino immigrants add to the complexity of understanding this rapidly growing population and determining how best to convey health information to it.